Home / Shop – Vintage Watches For Sale Used & Antique / Uncategorized / Enicar Sherpa Graph Valjoux 72 Chronograph 40mm. Enicar Sherpa Graph Valjoux 72 Chronograph 40mm. 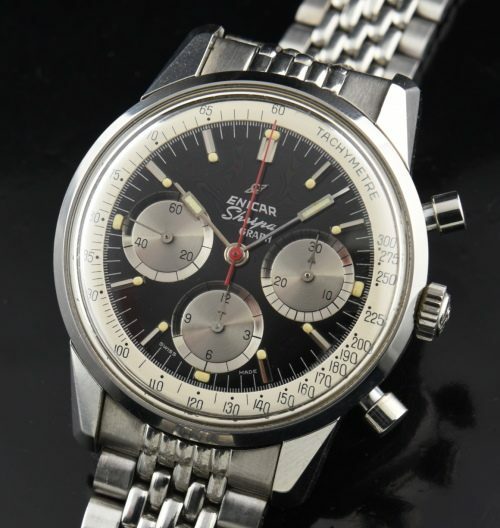 This is the finest example of a circa 1965 ENICAR SHerpa Graph chronograph I know of anywhere. The 40mm. massive case was never polished-sharp edges and even has the original sticker from the factory on the case back. The dial is simply amazing… puffy luminous…all original including the hands. The silver sub-dials really reflect the light. Crown and crystal are original. The amazing Valjoux 72 manual winding movement is accurately working perfectly. We are not opening the case back to risk damage. This watch even has its original and tight ENICAR bracelet. This watch was stored in a safe since the mid-1980’s and not worn. The watch appears to have BARELY been worn for its entire life! This is among the LARGEST of all chronographs produced during this era and utilizes the same movement as the ROLEX DAYTONA during that time. These watches were chosen by professional race car drivers throughout the 60’s due to their large size and easy readability. I am pricing this watch EXTREMELY well-far rougher examples have sold higher on eBay and other sites. Bankwire only.